The British car industry has grown four years in a row, mainly helped by cheaper finance and stronger exports. Car manufacturing reached a ten year-high in 2015, growing 3.9% year-on-year to 1,587,677 vehicles. Both domestic car production and domestic car registrations have continued to grow in the first months of 2016. According to the Society of Motor Manufacturers and Traders (SMMT), car production increased 13% in H1 of 2016, to 897,157 units. Exports increased 14.9%, while production for domestic demand grew 7.1%. A major strength of the British car manufacturing industry is its diversity, with a mix of volume, premium and specialist producers. The proportion of premium and specialist cars, in particular, has grown in the past decade, leading to increasing demand from outside the EU. With increasing car production, demand from UK car manufacturers for components produced domestically has increased in the past few years. Currently about one third of the components in a UK-built car are domestically sourced. The short-term outlook remains positive. Among the global manufacturers investing in UK production are Bentley, Honda, Jaguar Land Rover and MINI - all with new products due to roll-off production lines in the next couple of months, and this should have a positive effect on the automotive supply chain segment. Overseas demand for cars produced in the UK is expected to remain robust in the coming months. The UK new car market grew 3.2% in H1 of 2016, with more than 1,420,000 new cars registered, which is the best half-year performance ever recorded. Growth was reported across all fuel types. Demand eased slightly in June 2016, with a 0.8% decrease in registrations, meeting expectations that market growth would stabilise. Meanwhile, the British car retailers segment has posted increased profits. That said, a challenge that the automotive retail sector is facing is the impact of the increasing number of nearly-new used vehicles returning to the market. Used car supply is increasing as the new car market grows, and this could potentially lead to lower margins for used car sales. Payments in the UK automotive industry take around 60 days on average. Protracted payments in the sector are rare and consequently we have seen no increase in notifications of non-payment over recent months. 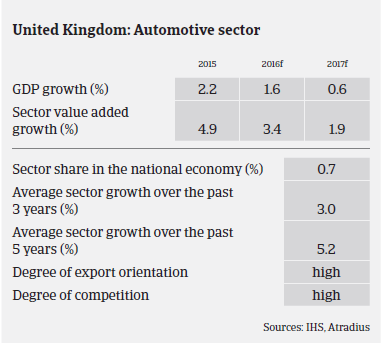 Compared to other UK industries, the automotive sector’s default and insolvency rate is good, with a stable outlook. 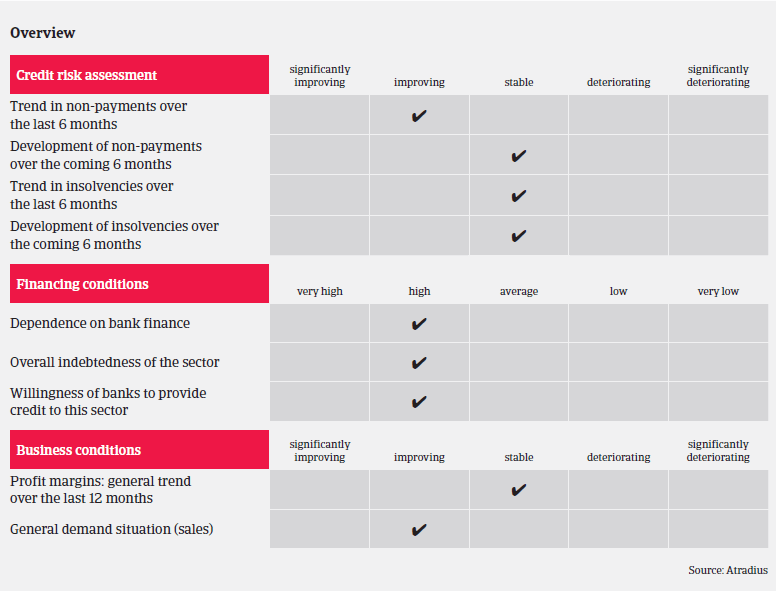 As in 2015, our risk underwriting stance remains positive towards most parts of the UK automotive sector, given the good payment and insolvency performance and reflecting the on-going robust car demand in the UK and in the eurozone. 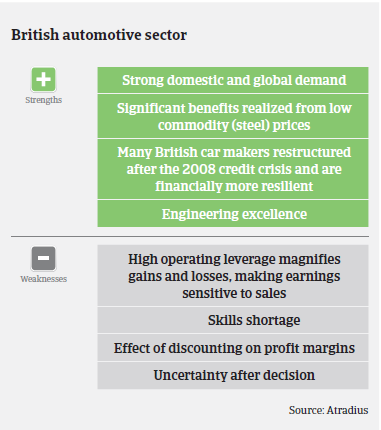 Despite the benign short-term outlook, the industry remains very susceptible to global economic volatility, while the Brexit decision will surely have an impact on the British automotive sector in the mid-term. The decision to leave the EU has already increased exchange rate volatility and affected UK business and consumer confidence, with companies delaying hiring and investment decisions. GDP growth is expected to slow down to 0.6% in 2017, which, together with the on-going insecurity over the Brexit, could slow down domestic car sales and affect car retailers and producers alike in the course of next year. The depreciation of the pound will push up the cost of importing both vehicles and components (about 87% of domestic vehicle sales and 65% of automotive components are imported). Any significant cost increase is likely to have a negative impact on sales, unless dealers and manufacturers absorb a share of this increase, which would negatively impact their margins. Foreign-based car producers with operations in the UK could suffer from a deterioration in profits and an impairment in assets. For the time being, it remains to be seen which are the true implications of the Brexit for UK automotive manufacturers. Leaving the EU could mean that European export tariffs would make producing cars in the UK more expensive. Currently 57% of cars made in the UK are exported to EU countries. In addition to any potential trade disruptions, the sector would lose benefits from EU funds for manufacturing research and development. Fierce competition, high energy costs and increased uncertainty due to the Brexit decision continue to weigh on the financial strength of many businesses.